Chernobyl is a hybrid of Train Wreck x Trinity x Jacks Cleaner x Space Queen. When I came out West I started on a quest for the best Trainwreck cutting I could find. I was not impressed with the Arcata cutting as it was too tall, too slow and too bisexual for my taste. I had written off this legendary strain until I came across an amazing plant discovered by Smokescreen found inside a bag of Dank. Of the few seeds found one female exhibited all the traits of the famous wreck without producing a single male stamen even late into budding. The complex late colouring is a thing of beauty and the potency of this mother is epic. Extremely potent smoking just a few bowls is an adventure in repertory failure and flat lining your brain waves. We decided to combine this incredible female with the genetics of Jack the Ripper. Chernobyl can be cultivated both indoors and outdoors. Best way to grow is topped early and trained to stay as low as possible. Chernobyl gets huge outdoors. 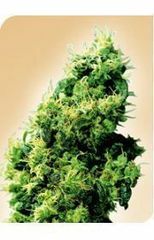 Flowering time for cannabis seeds is 8-9 weeks. Taste like Lime Slurpee or Sherbert and high is strong and pleasant very good for pain relief without paranoia.